The head of Microsoft's Windows division Steven Sinofsky is leaving the company effective immediately, with rumors suggesting the circumstances are similar to the recent departure of Apple executive Scott Forstall. According to AllThingsD, Microsoft's official stance is that Sinofsky is leaving on amicable terms, though people familiar with the matter said "growing tension" between the Windows chief and other executives may have helped move along the decision. In a press release issued by Microsoft, CEO Steve Ballmer briefly lauded Sinofsky's previous work before noting the launch of Windows 8, Surface and Halo 4, among other company products. It is impossible to count the blessings I have received over my years at Microsoft. I am humbled by the professionalism and generosity of everyone I have had the good fortune to work with at this awesome company, Sinofsky said in the statement. In a letter to Microsoft employees obtained by The Verge, Ballmer wrote that Sinofsky "decided to leave the company." 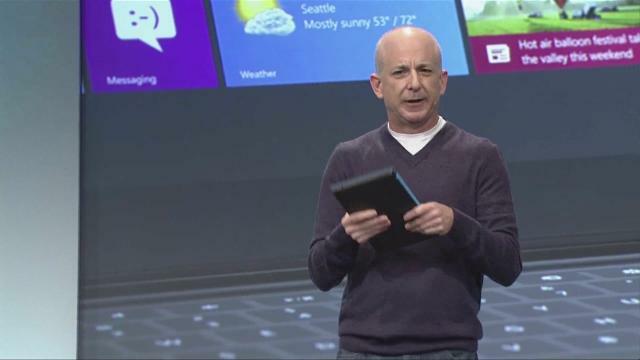 Sinofsky was instrumental in the creation and development of Microsoft's new flagship Windows 8 operating system, as well as Surface, the company's first in-house designed and manufactured computer. The former executive ruffled some feathers after the launch of Windows 8 in October when he called upcoming Windows computers great deals compared to "recreational tablets," alluding to Apple's iPad mini. The executive's departure is similar to the ousting of Apple's former head of iOS Scott Forstall, who was also said to be difficult to work with. Julie Larson-Green, who previously held multiple roles as she worked on Internet Explorer, Microsoft Office and a number of other major initiatives, will take some of Sinofsky's duties in leading all Windows software and hardware engineering. Current Windows and Windows Live CFO and marketing head Tami Reller will add the "business of Windows" to her responsibilities. Both executives will report directly to Ballmer.